This dense moisturizer is packed with some of the most heavy-hitting oils that address the pains of skin that tends to be on the drier side. It has a faint, floral scent — most definitely rose geranium, the namesake — that isn’t overpowering at all. A base of camellia, sweet almond and jojoba oil make for an incredibly soothing concoction that’s then thickened up a bit with beeswax. 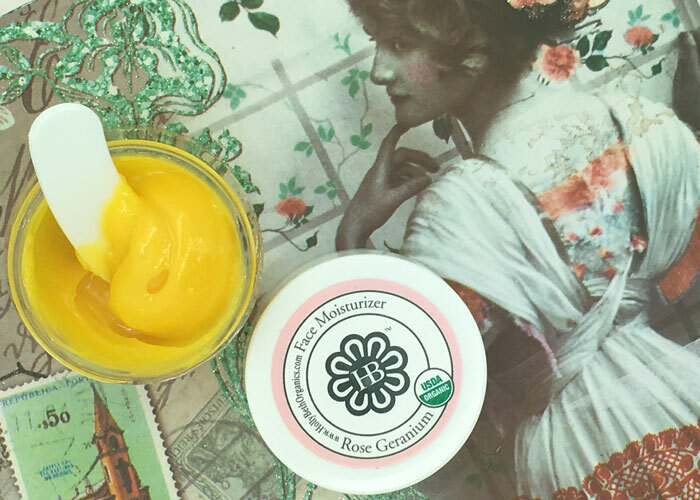 This gives the moisturizer its dense texture that’s easily spreadable atop a hydrosol. It also makes the moisturizer perfect as a spot treatment for dry patches, which is how I used it on my combo/oily skin. Because of how thick it is, I used this moisturizer during colder months and then applied it only as needed to those fussy dry patches. To keep it from going to waste, I also used it on my hands and feet to ensure I got the most out of it, as it was too heavy for everyday use on my face, but absolutely wonderful on the body. You’ll see that the formula also boasts a shot of sea buckthorn oil, which lends its pretty golden coloring to the final product. Sea buckthorn is another hyper-moisturizing oil loaded with essential fatty acids and carotenes. To top it all off, HollyBeth Organics stands by its branding and includes organic ingredients in this formula. I’d recommend this moisturizer for someone with normal-to-dry skin who likes a dense, balm-like moisturizer. Depending on how dry you are — and your climate — this may be more of a cold-weather moisturizer, or it could be your everyday jam. What do you look for in an everyday moisturizer? What creams, balms or dense moisturizers are in your arsenal? Do you prefer to buy samples before you go all in? Tell me in the comments section!